On a piping hot 42°C summer day in Melbourne, a brown paper package arrived at my desk. It was torn and half opened, clear evidence of a long trip. 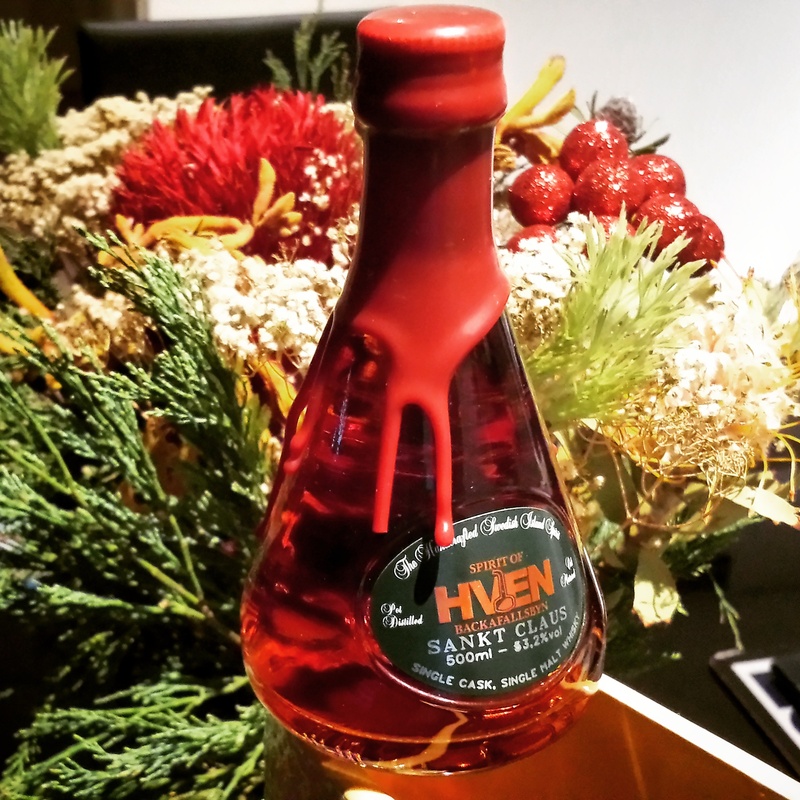 The package was marked with Swedish writing and peeking outside its tears was a deep ruby red whisky, Spirit of Hven’s Sankt Claus. What a contrast, from ice cold Sweden to sun burnt Australia. Spirit of Hven Sankt Claus, as the name suggests, pays homage to Saint Nicholas. Saint Nicholas is the patron saint of a number of groups including sailors, fishermen and, perhaps most appropriately, brewers. He also had a reputation for secret gift giving by leaving coins in the shoes of people, and he therefore became the inspiration for the big bellied white bearded jolly man we call Santa Claus. Spirit of Hven Sankt Claus is intended to “”bring the most joy and (de)light to the winter darkness”, but having just enjoyed some of it on a few bright and very hot Australian days the whisky also inadvertently brings this festive cheer to snow-less lands as well. Even ones that reach 42°C over the holiday period, such as my home city in Australia. Sank Claus is made from Pale Ale malt and peated malt (48ppm) and fermented for 120 hours, during which the Cerevisiae and Bayanus yeast converted the sugars in the wort into alcohol. Once the wort was fermented, the wash was distilled and a generous heart was collected from the spirits run which it can be assumed included a bit of tails to give the whisky some tasty congeners. Once distilled, the spirit was matured in air dried French Allier oak which had previously contained Merlot. Stewed berry fruits are first noticeable, with rhubarb, strawberry yogurt and panetone. Undertones of sourdough and olive bread sit beneath the fruit with balsamic, star anise and cinnamon. On the palate the whisky is potent, warming and drying. The barley is rigid and bold, and the flavours of the whisky are integrated and balanced – find raw sourdough, heavy red wine notes, sweet red candy, red berries (especially cranberry), cinnamon, dark chocolate, sweet vinegar,, ginger bread and crushed nuts. The finish offers mild creaminess, with notes of nutmeg, cinnamon, cooked berries, balsamic glazed beetroot, pepper and wisps of smoke. It is somewhat drying and vapourous, again expressing red wine astringency combined with barley. Buy it, if tis’ the season to be jolly. Find a plethora of all things as red as Rudolph’s nose in the whisky – red fruits, red wine, red candy, red berries, and even a dash of eggnog (an eggy nutmeg note, if you pay close attention). Granted, the nose does present with some aromas that indicate the whisky would have benefited from more time in oak but the Christmas flavours really come through on the palate such that any more time in oak may have altered the festive theme in this dram. This is a potent, rich, drying yet sweet whisky that is absolutely perfect to drink during the festive season. The maturation of this whisky in Merlot barrels certainly gives it a unique flavour profile, and the people at Spirit of Hven have done a superb job selecting this cask of their “Sankt Claus” expression (which is intended to have a Christmas theme). With each sip, I can hear the jingle bells a’ ringing. This entry was posted in Swedish whisky and tagged Christmas, Merlot, sweden, swedish whisky. Bookmark the permalink.